TFH Magazine Forum • View topic - Hello from the Great White North! New to the TFH Magazine forum? Let this be your starting point. We would love to find out more about you so please introduce yourself and be sure to tell us about your fish! The beautiful city of Saskatoon which is also the name of a berry known as a super fruit with anti-oxidant powers but unfortunately not Pomegranite as guessed by Mr Nelson. It's jsut a couple hours north west of Moose Jaw, Saskatchewan, Canada (featured both on the Simpson's and Atomic Betty). How did I start in the hobby? My start in the hobby all started innocently enough a little over a year ago. My daughter wanted a pet but we weren't able to get a cat because if she goes near one her eyes swell up like Mike Tyson just laid a whooping on her. Cute once but not ideal for the long run. Also our busy life didn't lend itself to a dog, that and my wife vetoed that idea. So my artist/designer brother who had kept fish for a number of years before upgrading to a cat and icelandic sheep dog a few years ago suggested I get the stylish Black Fluval Edge for the living room. The first fish we stocked the Edge with after it cycled for a few weeks and had the necessary levels were 3 zebra danios, 3 leopard danios and 2 otocinclus over a two week span, as the danios were recommended as good starter fish, by both my brother and the store, and we needed janitor fish. If I could do it all again I'd likely have started with at least a 20 gallon long to give the danios the space they need and bought them after our vacation. Realizing things could go awry while on vacation or while fish stores were closed I purchased a used burnt orange Fluval Edge cheap for spare parts. But when I went to pick it up the fellow had five dwarf rasboras he threw in for free and the filter was fully cycled and ready to go. It also didn't help matters that my oldest really wanted those exact fish. MTS is it a disease? Within two months I had started down the road to full-fledged MTS with a tank in the living room and one in the kid’s room. The small confines of the edge didn't help matters either as I soon realized I couldn't keep all the fish the kids & I (mostly I) wanted to keep. It also made me inherently research and start keeping small fish around the 1 inch mark as one or two fish swimming around didn't cut it. Zebra, leopard and gold danios are the largest fish I ever knowingly purchased. We did have a single corydoras CW064 sneak along in a purchase of 8 corydoras pygmaeus. Marimo moss balls and some java moss (Taxiphyllum barbieri) were also purchased around the same time for my first beginner plants. The kids wanted some shrimp for their tank and I figured they should have something to graze on. I also came upon some flame moss (Taxiphyllum incendia-stipes) a short while later and added it to my tanks at the time. Six months after purchasing my first tank (FTP) then purchased my third tank a 10 gallon to use as a QT tank which then quickly became stocked and didn't quarantine any fish except the initial two batches purchased and put in it. There was an episode with fungus so it actually worked for its intended purpose and has the medication stains on the silicone to prove it. Somewhere along the way I came across some Christmas Moss (Taxiphyllum alternans) and added it to my former QT tank. Nine months after my FTP I purchased a fourth tank to try my hand at raising some red cherry shrimp. It was also to avert Sponge Bob Square Pants ornaments in my other tanks as my kids wanted them along with bright royal blue sand and fluorescent plastic plants. The two 10 gallon tanks were somewhat calculated as my homes basement is currently unfinished and my wife said I could build a small fish room with a tank open to the future family room. They would end up being QT and/or breeding tanks once everything is built. I am currently contemplating a single 125 gallon or a couple smaller tanks no longer than 7 feet combined for the family room/fish room shared wall. So there may be a journal in my future. Schmidtsie is my handle as it’s my longest standing and still current nickname. Ostrich, Trench, etc. have all gone by the wayside. Fish will die, especially when there's a long power outage and it still bothers me when they die. If it stops bothering me I'll stop this hobby. Don't overfeed as it can lead to all sorts of bad things like cyano bacteria, bubble algae, unhealthy fish, etc. Keep up with regular water changes. Weekly pill boxes work great for measuring out food for house sitters. You can kill java moss. Haven't found an aquatic plant website that frequent for into. Drip acclimatizing new fish is the best way to introduce them to a new home. Bug catching containers from the dollar store make great specimen containers for meds, dips and new fish. Horned nerite snails along with a few shrimp do an awesome job keeping a nano/small tank cleaned. I likely needlessly killed a few otocinclus until I figured this one out. Amano shrimp will pack hunt and shred a smaller fish than the female amanos to bone in a few hours. The Edge is likely a death trap for fish that can surface breath. There's always things to learn in this hobby. Landscaping/garden centres are a reat place to by rocks/aggregates cheap. And most importantly it's a great way to relax and de-stress. This shall be fun and I never knew I was this long winded. Proper Intro: Hello from the Great White North! Re: Hello from the Great White North! Holy Schmidtsie...that's got to be the longest and best introduction post I've ever seen here...welcome to TFH Forums, dude! Sounds like you've conceded to your addiction very quickly...and it's definitely an addiction, don't ever doubt that. I'll issue fair warning...you'll likely make acquaintance with one of our other Admins, CrazyGar, who happens to reside there in Saskatoon with you. Good dude, just talk slowly when you meet him, and don't stare ...you'll know what I'm talking about when you meet him. Welcome officially to our Forum! You are off to a great start. Forget about all the other tanks, I just want a picture of the Bikini Bottom Shrimp Resort! Best intro I've read yet! Riveting! I really hope you do start journaling here. You will definitely have me as a reader. Welcome again to the forums! I agree! I wanna see that Bikini Bottom tank too! Sounds really cool! "Just add water" doesn't apply to fish tanks. You are in 'Toon Town? Are you a part of the SAS? Wow, a Local Boy! Welcome to TFH my friend! Good dude, just talk slowly when you meet him, and don't stare ...you'll know what I'm talking about when you meet him. I am getting better, at least the Shrink says so, ha ha ha. Just don't listen to the voices in your head Gary; don't listen to those voices. I can't help it. They tell me to staple my lips to the wall, but I can't find my stapler. Stabler? Is that the American version of a Stapler? Waht? R yuo saaying eye cann't spel? From the sounds of it Schmidtsie has already hooked up with a few members of the SAS (I am the Technical Admin on the SAS - Gary MacDonald) as some of the plants and fish are familiar to the area. I'm doing a talk on Otocinclus at the August 26 meeting of the SAS, you should attend, we always have a good time. Thanks for the intro again. Thanks all for the warm welcome! And the compliments on the intro, I had initally thought it was a bit too long winded and would put people to sleep. *there's no sleeping smilie? * Keep in mind there's no guarantees on the riveting aspects of future posts but I'll do my best. Yes, Gary I am in Toontown (haven't heard it refered to that in a while though) and we should try and catch up with one another at some point. I do own a Swingline Stapler as well as a staple gun should you need to borrow one or the other. I don't know if 'hooking up' is the right terminology unless the SAS is one 'swinging' place. I've met one SAS member and purchased some hardware (burnt orange fluval complete with heater, net and fluval decoration) and 10 fish (5 dwarf rasboras and 5 pygmy corys) from him. I've purchased all my plants and most of my fish pretty much from a Canadian owned full line pet store franchise nearest my house or its sister store on the opposite side of the City (a whole 15 minutes away). Whereas my hardware has come from them as well as an international large specialty retailer of services and solutions for the lifetime needs of pets. I did some digging and here's the fish photo I ever took of a fish tank in my house. It's the Black Fluval Edge just after it was stocked with verifiable lifeforms (aka zebra danios). 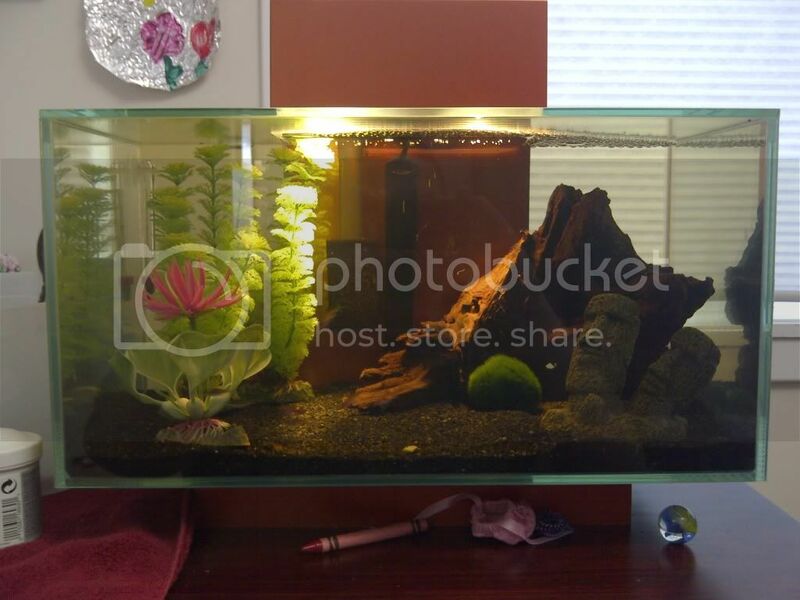 I also happened across a photo of the Burnt Orange Fluval Edge after it was set up in the kids room, hence the crayon, teddy bear ballet slipper, marble, hair band and tinfoil art in the background and below the tank. Please forgive the quality, the water spots, etc. as they were taken with the first Crackberry I have ever owned and didn't realize they were as bad as they were until viewing them on the computer screen. The oldest daughter was also insistent on a few of the decorations in each of the tanks. The buddha statue, the easter island statue and the pink flowers. I looked for a first photo of the Bikini Bottom Shrimp Resort but alas could not find one, so you'll have to stay tuned for my next post. Which may take a while as my youngest daughter dropped our point and shoot camera Wednesday night while making videos in the house. There was some chasing and tripping and I'm still not quite sure what happened but that's the best I can find out. The lens is now at a gruesomely awkward angle and won't close. Hi my name is Schmidtsie and I'm a full-fledged sufferer of Multiple Tank Syndrome (MTS). Great photos! Nice layouts in them too. 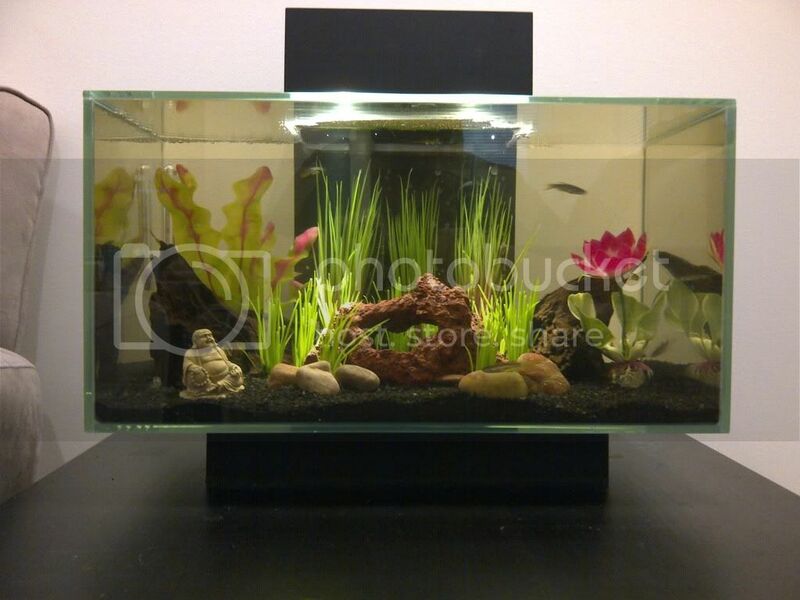 I'm still searching for a photo of my very first tank. I know I have it somewhere. It was nowhere near as attractive as your tanks. My daughter got a good laugh out of your "full-fledged sufferer of MTS" comment. She knows I'm a "carrier" of the disease who could break out at any moment if not kept in check by my wife. I have no female inhibiting force quelling my obvious deviant behavior. Actually, with my lifestyle (quite the busy guy) two tanks is more than plenty. Let's see Petland or Petsmart. Have you tried "World of Pets" in Lawson Heights? Curtis has some cool fish from time to time.